Born on June 11, 1955 at Orleans, he is the youngest of four children. His father is a farmer and his mother works in a bookshop. 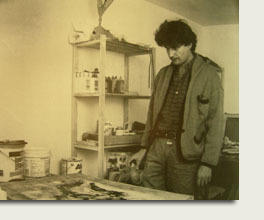 In 1975 he exhibited his works in Orleans for the first time. In 1978, he visited Italy and familiarized himself with Quanto Cento, Italian Renaissance and Etruscan art bringing back several sketches of his travels. In 1979, he settled down in Paris and started carborandum etchings at the Pasnic workshop following the procedure of Goetz used by Coignard, Clave, Miró and Tapies. About this time he created an illustrated book with the poet Jean-Jacques Scherrer with whom he was acquainted. He also met with James Coignard about this time. Since 1980, he has been working with Bruno Roullard, an editor in Paris who exhibits his work in the USA. He is also good friends with the painter Jean-Claude Lemercier. He has had many major exhibitions at prominent galleries in North America and in Europe.